‘The History of Boxing’ tells the story of pugilism or the sweet science. From its roots in ancient Rome and Greece, to the first set of rules and its inclusion in the St Louis Olympics in 1904, the popularity of the sport continued to spread across the world. In 1927 the National Boxing Association became the first sanctioning body over the sport, and today four sanctioning bodies control the world of boxing. 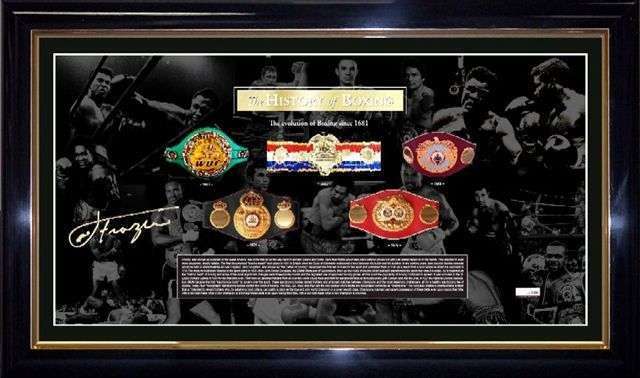 There have been so many Greats over the years and this amazing collage features many of them including Muhammad Ali, Rocky Marciano, Sugar Ray Leonard, Kostya Tszyu and Joe Frazier. World Champion Joe Frazier has personally put his hand to pen to be part of this project and has personally signed each print.